I have seen the same setting about a week ago and posted My horrid experience under The "new" Royal Opera House, Covent Garden thread, Page 31. My writing may not be clear, but I felt exactly the same. If ROH thinks their web site needs to be updated, please be user friendly & less clickings. I do hope this make over site would be ended just an experiment. It was really tiresome not being able to just go to a list of up and coming ballet performances in the main theatre. 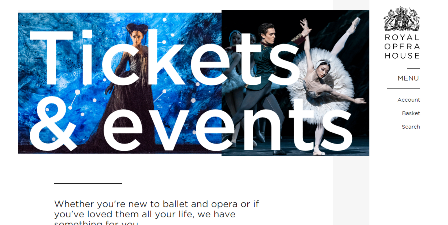 You know seem to have to scroll down through very large whole page ads of everything to do with dance including public events insight evenings rehearsals etc. etc! It is more efficient to list them separately as they were before so if you want Insights you just look at those if you want to take your baby or grand baby to a Dancing dots class then look under Public events .....if you want the Linbury events then keep all those together etc etc but keep the main theatre performances grouped together too! Trying to access quickly the triple bill in June was impossible. Though when I did finally get there it still wasn't very helpful anyway .....just the same old weird casting lists that have been the norm since open up. I’ve been seeing the new site consistently now for a few weeks (the main page and what’s on, thankfully it reverts to the old site once I click on anything else) and so far I have not found it to be an improvement. There are no handy links to seasons at the bottom of the home page or what’s on. You can filter by season but it brings up absolutely everything, not just performances, so you have to filter again and then again to drill down. Or you can look through the calendar, but to see each day you have to select it and then click ‘apply’. You can choose a range of dates to see what’s on but all it does is give you a list of what spans those days, not exactly what’s on for each individual day. Once you click through you have to remember what date it was you were looking at to select it. The old calendar is much better. No matter how much you might filter or what date you select, when you get to the list of what you think you want there’s lots of dead white space and everything set out in huge blocks of large photo-title-date-venue-blurb-more info button which mean you scroll and scroll and scroll endlessly to browse. Not the most efficient way of communicating content. 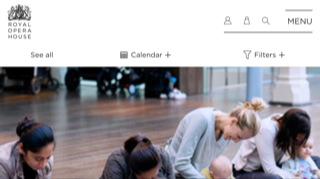 Don’t be tempted to use a phone/tablet in landscape to look at the site – it’s like looking through a letter box as the banner and the ‘see all’, ‘calendar’ and ‘filter’ buttons at the top are so huge. I’ve taken to using the search box as the quickest way to get to what I want, which is fine as long as I know what it is I want! I don’t know how I’d ever discover any new events on there. The other day a feedback box popped up while I was using the new pages so I sent off my observations. I realise websites need updating sometimes, but to trade in the easy to use old site for what could end up a vast white labyrinth doesn’t make much sense to me and I hope there is a serious rethink before any more of it makes it online. Well, glad you said it. I think it is a mess. It's all about design and has zero to do with functionality. A bit like the beige carpets. So irritating when you just want to go quickly to an event. Who on earth is in charge of all these changes that just don't work? I have the ROH News page saved as a Favourite on my pc. It still has the 'old' format of seasons at the bottom of the page and all the 'old' options such as seating plan. I never bother with the new Homepage at all as it is just too confusing and uninformative. The only time I use it is if I want to find out about things like the rehearsals in the Hamlyn Hall. There I use the new homepage. Click on What's On and below the calendar, under 'Functions' (?!) there they are under Ballet Studio Live. Having said that, at the bottom of this page (What's On) the old seasons are there. The thing is, I want to know what's on and am prepared to take the time and trouble to find out. If you weren't committed and just wanted to browse generally you might well give up. How are the ROH going to get these new customers to replace us if they can't easily find out what's on and can't find a box office in the building itself? I know most people may want to book online these days (I do myself but I don't live near London). However, I still think it's very bad there isn't a box office on site and (as far as I could see) no directions in the new Open Up area as to where there is one. Having said that, at the bottom of this page (What's On) the old seasons are there. It must depend on what browser/device one uses as I definitely cannot see any season links at the bottom of the new What’s On page. I usually access the site via a mobile device - I wonder whether I’m getting what is meant to be a ‘simplified’ view. I have saved ROH website screen. This is the page I see on my laptop after opening what's on. I don't have that at all- how very odd. Is it the future? 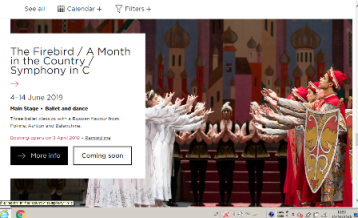 Right under Tickets and events, dance secion is listed. My laptop shows this page, but smart phones show the current or old page. When you click this Dance and event, this event comes up on top. Yes, it is in dance category, but I would say majority of us would expect a performance at main auditorium. I guess events are lined up chronogically. This event happens on 11 Feb.
Then Double bill on 12th Feb appears under Ballet Dots. By the way, if you click 'filter' you would see this. Forgive me bombarding the postings. This is due to upload limit. When you come across the performance whis is not open to book. You would see this image. 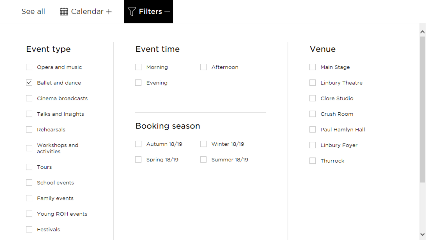 When you open 'more info', you will see performing dates with details which is familiar to us. From your screenshots, Yumiko, it can be seen just how ‘blocky’ the new pages are. Each event takes up pretty much the whole screen. Below is how the What’s On page looks on my phone in landscape. Is there a separate thread about the website? I had a quick search but couldn’t see one. Well, I would definitely give ROH some feedback! A lot of (not all) web design now seems to start from the assumption that people are viewing websites on a tablet and really, really like scrolling. While I imagine that there is sound research behind the first - though I think they underestimate how much viewing is done by people at work on their desktops - any figures to back up the second are IMO because people are given no choice in the matter: designers create websites which require endless scrolling, so people scroll more than they used to, then researchers see people scrolling more, so designers respond to this research by... it's a circular process. So please give feedback - it's the best way of breaking through the designers' bubble. I don't think there is a dedicated thread on new looking ROH site. Part of the new/updated ROH website is now being rolled out, albeit still in a limited fashion, to some users. Following a number of posts about it on the spring booking thread, it seems an appropriate time to start a separate thread for discussion and to help those who may be struggling to navigate it. The idea that everyone is now looking at websites on some sort of mobile device is one of my major annoyances. Yes, a lot of people do this, but personally I like to access the web in the comfort of my own home, via my PC with its nice, wide monitor, comfortable full sized key board and a separate mouse. Thank you very much for starting the new thread, Thalia. I've moved a lot of the earlier posts from the Spring booking thread into this one, and many of them precede yours chronologically, hence your post being so far down the list! 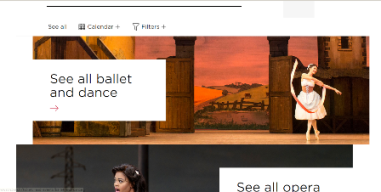 Many thanks Alison - the Royal Opera House website also gets a lot of critical coverage in ‘The “new” Royal Opera House’ thread. I'm sorry to hear that people are having problems with the new website. Thankfully apart from the front page (and the irritating new Shop) the rest of the site has stayed the same for me. I use Chrome as my browser, I don't know if that makes any difference? Seconding this, especially when ticket booking & select-your-own-seat seating plans are involved. I only do ticket booking on my phone if I really have to. Frantically jabbing at tiny circles on my phone screen trying to select the right one is not my idea of fun! I'm still getting the old-style ROH web pages on both my laptop & phone at the moment. This is by typing in the URLs directly, not going to the new homepage, which I find very unhelpful. I have had one oddity for several months: in order to go back a page I usually have to click the back button not once but 4 times in rapid succession. not going﻿﻿﻿﻿﻿ to the new homepage﻿, which I find very unhelpful. Exactly. The same for the 1pm Friday rush tickets. In fact I don't think the ROH ever has any booking opening outside standard office hours, does it? (Unlike the Proms that have theirs on a Saturday morning.) I popped onto the ROH website just before 1pm this past Friday, grabbed a side stalls circle ticket for Tuesday's Two Pigeons, & was done within a couple of minutes. If I'd been using my phone I reckon it would have taken twice as long as each page loads more slowly on my phone than a PC, as well as it being harder to select a specific seat. I totally agree. I've just had a look at the homepage & currently the largest text by far is being used for "Open" and "Eat & drink".